- Are you interested in elves? - Did you know that 54% of the Icelandic nation belives that elves exist? - And would you love to spend one plesant afternoon in listening to true stories of friendship between elves and Hidden People and Icelanders in recent times, and eat pancakes and drink coffee or tea in the meanwhile? “My wife and I attended The Elfschool this afternoon. I genuinely enjoyed every minute of it - Magnus the headmaster is a magnificent character. A man judging by today's performance who is not afraid to go off on delightful ridiculous tangents, dive into the dark world of politics without a word of warning, discuss his pretty out there theory regarding schizophrenia. ... All this aside once you peel away his quirky nature you will see a man who clearly loves what he does and throughly enjoys opening up about old Icelandic culture, tradition and of course has tremendous ability to enthral a room with some fascinating stories regarding the hidden people. I read the other reviews just before posting mine (curious about what impressions others had and to be fair they were a mixed bag - some made me laugh out loud!) I think you must just allow yourself to enter the world of Magnus for the 3 or so hours. I promise you if you do you will come away with a wealth of knowledge that will give you a greater understanding about the old ways and possibly even sparkle a bit of magic into your own life. If in doubt think let me leave you with this fact. I'm a 34 year old man that would be a cynic (despite my best intentions) and like to think that I can smell BS from a mile away but you know what I did straight away when I got back to the apartment? I opened up the Elf Book he gave us and read it from cover to cover. I would highly recommend this activity - just don't worry about the size of the room or his eccentric ways.... Allow yourself to get lost in his world and let him take you to the invisible people, you never know it might just open up a whole new world for you. “Having read the reviews on Trip Advisor I thought I knew what to expect from an afternoon spent at The Elf School. Yes, it was a memorable experience; yes, Magnus is a master story-teller; and yes, delicious bread, pancakes and coffee are served during the break. What I wasn’t prepared for was just how much I absolutely loved my time there. The four hours (not too rushed start, and pleasantly indulgent break), whizzed by and it was almost over before I realised. I could have stayed much longer to listen to what Magnus had to say. In fact, I could happily have spent all week there! The School has been running for 30 years, and yet Magnus’ stories and description of events in Iceland, and in other countries he has travelled to, were as fresh and new as if he was telling them for the first time. The Elf School describes itself as an introduction to the Elves and Hidden People of Iceland, and certainly, if you are interested in this subject matter you won’t be disappointed; however, there is so much more to it. It is not a history lesson, but you will gain an understanding of how the ancestors of modern Icelanders lived. Nor is it a lesson on culture, or religion in Iceland, and yet you will gain insights into how and why this beautiful country has developed into what it is today. Facts are mixed with beliefs, folklore, and recollections of those whose stories have been passed down through the generations and those who are still alive today. “For the beginning Magnus is a really nice and funy man. You need to have a good humour, especially when you are from Germany or the States. Or if you are a Republican ;). “I really enjoyed this afternoon, the whole atmosphere of this ok bit special place. But hey, thats how it it is and makes it unique. Magnus is very authentic in his way of telling stories and acting with his "students", making jokes etc. Its not a typical school class. It is the atmosphere and the whole spirit around him and how he tells stories and how he talks about the Icelandic culture. Good to understand the Icelandic culture and why elves and hidden people are part of life in Iceland...” - Klaus Jenter. Germany. “Its impossible to be in Iceland and not hear about Elfs, Hidden people & Trolls. Attending the school on day one was a great idea. It was much more than I expected, a good mix of storytelling and history with lots of opportunity to ask questions throughout. ... I thorougly enjoyed it.” - Tom Carter. US. “This is your must to see in Reykjavik when you are interested in Iceland an its special relation to paranormal and elfs. Magnus is a very warm and gentle teacher making lessons lively and interesting. Many exciting stories about real happened events between "normal" Icelanders and elves. ... Also questions about history and society of Island will be answered . Unforgettable are the pancakes in the break. I would love to come back.” - Linda Oneill. Canada. “During our recent trip to Iceland, my husband and I attended Magnus's Elf School, and it was one of the most unique experiences of our vacation. Magnus is, above all, a master storyteller. He is the kind of person we could listen to for hours, whether it be about elves or earthworms. (And given his penchant for trailing off, you might just learn a bit about earthworms!) The "school" was very informal, and by the end of the afternoon, it felt more like a group of friends discussing the unknown than an expert lecture. We ended up staying beyond the scheduled, and if it weren't for our need to eat, we could have talked with Magnus even longer! Speaking of eating, the bread and blueberry pancakes served during the lecture truly were the best in Iceland. My husband has a nut allergy, and Magnus did everything he could to check on the products for his safety. Other reviewers mentioned the campus and location as negatives. The location is not particularly close to city center, but I downloaded the city's Straeto bus app which makes paying bus fare and planning trips exceptionally easy. The bus app also comes in handy if you plan on visiting any of the city pools. Besides, isn't the point of visiting Iceland to discover interesting places outside of city center? The Elf School certainly fits that bill. It's also true that the campus is not the most organized space I've ever seen. However, the charm of the Elf School is that Magnus is funny, engaging, and passionate, not that his books and trinkets are nicely arranged. - Do you want to know why 54% of Icelanders believe that elves exist? - And do you want to know where these elves live, and what they look like? - And do you want to know everything that is known about their culture, tradition and habbits? - And do you want to know why so many elves and Hidden people are in Iceland? - Much more than seems to be in any other Western country? - And do you want to understand what these "other dimensions" are (which the elves and the Hidden people claim that they live in), and what we know about that, as well as what the psychic ability is (or the sixth sense), that seem to be the main way to see or sense these friendly beings? - And do you want to hear true stories and explanation of real and deep friendship between present living Icelanders and elves, that sometimes has lasted for lifetime, - for a very little and fair school-fee (just 54€, or 64$)? - And do you want to meet one of the best expert in the world in elves and Hidden people, and Nature spirits in general, - and hear his lectures, - and have a chat with him after, - and ask him also all the questions you might have in mind about all this, - for about 3 to 4 hours, (and eat pancakes with cream and jam, - or the best bread in the country, - in the meanwhile)? The Elfschool is about two lecturers, before and after the coffee-break, - with the bread and the pancakes and other delicious things the school offers to all its students (for free) aside the teachings of this strange phenomena in Iceland. 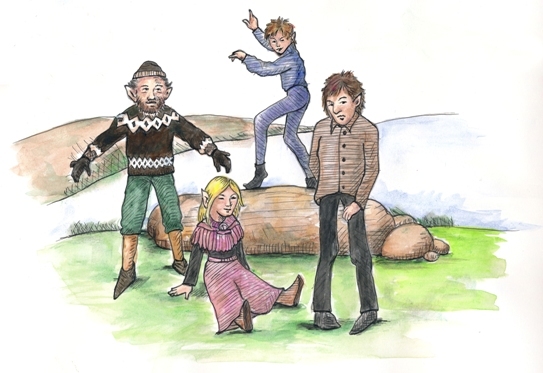 The background of this folklore is looked at, with a critical and historical view but also a lot of true stories of friendship between Icelanders and these mythical beings in modern times are told to the students in the school. - About 2/3 of the school is the telling of all these different stories of this very unique but real friendship in recent time. - Stories that all of them have been collected by the headmaster of the Elfschool himself from the witnesses in the last forty years or so. None of these stories have been published jet, but some of them will hopefully be published in the coming years.